Home of Simulation & Training Research and Your Portal to Modeling & Simulation at the University of Central Florida. The Florida High Tech Corridor boasts of the highest concentration of simulation and training related activities in the nation. IST's primary focus is on human-in-the-loop simulation and modeling of human activity. Other UCF departments focus on science-based simulation; we can help you find those appropriate for your needs. The Modeling and Simulation Graduate Program was initiated in 2001-2002 with directions from high university officials to create a multi-disciplinary program. Virtually all Modeling and Simulation graduate programs are part of computer science or engineering departments. Our program is currently drawing classes and faculty from a dozen or more academic units. Given that the field of Modeling and Simulation has grown so rapidly and in so many directions, the decision to make a multi-disciplinary program has proved to be the correct decision. The Program is largely administered through the Institute for Simulation & Training, and reports to the College of Graduate Studies. Our first ever SMST Day! 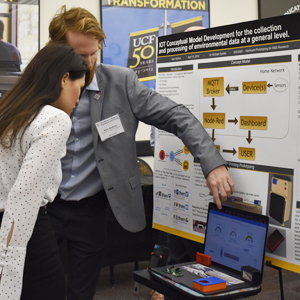 April 10, 2019 marked the School of Modeling, Simulation and Training (SMST)’s first annual “SMST Day,” in what will be the first of many day-long events aimed to help students connect with industry professionals. The event was a complete success, welcoming a variety of Modeling & Simulation (M&S) partners and recruiters, as well as, faculty and previous alumni. Despite the cold weather, UCF President Dale Whittaker and George Cheros, CEO of the National Center for Simulation, along with members of the Army cut the ribbon on Jan. 28th to celebrate Partnership IV. This is the latest addition to the Partnership Complex, our nation’s epicenter for simulation and training-related research and development. The UCF Institute for Simulation and Training is an internationally recognized research institute that focuses on advancing human-centered modeling and simulation technology and increasing our understanding of simulation's role in training and education. The institute celebrated 35 years of M&S research achievement 2017. Founded in 1982 as a research unit of the University of Central Florida and reporting directly to the Vice President for Research and Commercialization, the institute provides a wide range of research and information services for the modeling, simulation and training community. Faculty and staff are distributed among IST's three Central Florida Research Park buildings, Partnership II, Partnership III and the Simulation and Training Technology Center.